Meet Woodlands' new residents, Mary Margaret and Aubrey King! Aubrey (left) and Mary Margaret King have enjoyed living at Woodlands since they arrived in May of 2018. 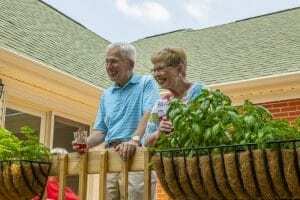 Mary Margaret and Aubrey King met while they studied at Marshall University in Huntington, West Virginia – the friendly college town that’s also home to Woodlands Retirement Community. After graduating and marrying, the Kings moved to Maryland and lived there for more than 50 years in various cities including Baltimore, Linthicum and Bowie. But when it came time for them to transition to their ideal retirement lifestyle, at first they weren’t sure where to look. In the end, after a lengthy search for their next home, Huntington welcomed them back. In May 2018, the Kings moved into their residence at Woodlands. With their deposit in place, the Kings had priority to choose their ideal residence. When their perfect residence became available, the Kings picked a first-floor apartment home with a wraparound patio. In addition to getting their favorite residence, they loved the ability to have their new home customized to their liking. The Kings recall that during their visits to Woodlands before they moved in, and especially during their first couple of months living here, the friendliness of the community really made an impression on them. The warm atmosphere at Woodlands reassured them that they made the right choice. The amount of activities at Woodlands was one of the first factors that made the Kings feel welcome. Mary Margaret said that she and Aubrey are both involved in playing bridge, playing croquet and participating in a singing group. Off campus, the greater Huntington community offers everyone even more to do, such as volunteering at local attractions like Heritage Farm. One of Aubrey’s favorite benefits of Woodlands’ location in Huntington is its proximity to the pair’s alma mater. While plenty of opportunities are available off campus, Mary Margaret also enjoys the convenience of Woodlands’ on-site amenities. The Kings chose a Continuing Care Retirement Community (CCRC) not only for their own comfort, but also to benefit their family. To learn more about making your ideal retirement possible at Woodlands, call us at 304-697-1620, or click here to schedule a personalized tour!